In 1985, the United States Armed Forces replaced the M1911 with the Beretta 92 F to the everlasting consternation of 1911 devotees everywhere. There were several reasons for the switch. The U.S. was the only NATO country not using a 9mm as the standard issue sidearm and there was a desire to issue a pistol chambered for the ubiquitous 9mm for logistical reasons. The Beretta will hold 15 rounds in its magazine as compared with 7 rounds of the military issue 1911 magazine and is lighter and easier to field strip than the 1911. The double action/single action Beretta was perceived as being a safer pistol to carry in a state of readiness than the “cocked and locked” 1911. In some quarters, the .45 ACP was viewed as too powerful and difficult to control for those having only nominal training with the weapon. Defenders of the 1911 will vehemently contest these last three perceptions, pointing to the superior trigger and durability of the 1911, and the superior stopping power and inherent accuracy of the .45 ACP cartridge. In terms of safety, three conditions must be met for the cocked and locked 1911 to fire: (1) a firing grip must depress the grip safety; (2) the manual safety must be taken off, and (3) the trigger must be pulled. Nevertheless, it looks scary and the Armed Forces have documented negligent discharges from improperly handled pistols. It could be said that the 1911 fell victim to its own mythology. I grew up hearing the stories of the .45–that it kicked so badly that an inexperienced person couldn’t hit a door from twenty feet away with one, that a man, struck anywhere on the body by a .45 round would be knocked down as if hit by a truck, and that you could shoot down a Japanese Zero with a .45. (A Zero was downed with a .45 but by a head shot on the pilot by an American aviator parachuting from a bomber. The Zero was trying to strafe the American.) In 1998 The FBI S.W.A.T. team adopted the Springfield 1911A1 as standard issue. Anecdotal evidence out of Desert Storm indicates that the Berettas jammed because of the fine sand in the desert and the Marines broke out the 1911’s. The M9, Beretta 92 F, has the smoothest slide and the lightest recoil spring of any major caliber pistol I know of. When you rack the slide of the M9, you can feel the precision and quality of its manufacture. Those bottomless 15-round magazines could prove to be life savers should you decide to shoot it out with the Crips or invade a small foreign country. My wife is of the opinion that the Beretta is the nicest shooting autoloader around. It has a very good trigger for a DA/SA and the long barrel and sight radius give it adequate accuracy. Too bad the 92 F is a 9mm. The 9mm is a reasonable defensive round. It will do its part if you do yours, but of course, the same could be said of a .32 caliber pocket gun. Questions have been raised about the “stopping power” of the 9mm and people whose lives depend on their handguns have been migrating away from the 9mm and toward the .40 S&W and .45 ACP in recent years. If I had to shoot someone and I had one shot to do the job, I’d rather that shot be a 230 grain .45 ACP. 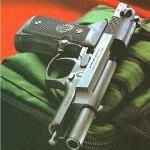 My target and competition gun is a Colt Combat Commander. The question of “inherent accuracy” is the grist of endless debates, but I do believe that some cartridges are more inherently accurate than others. I base this on nothing more than my own experience with shooting them. In my hands, .38 and .45 are more accurate rounds than 9mm and .40 S&W. I shoot .45 with much greater accuracy than I do 9mm, so it is more rewarding for me to shoot .45 for fun and competition. .45 ACP is heavier and more expensive than 9mm, and folks who are particularly recoil sensitive will enjoy the 9mm more than the .45. Last, but not least, 9mm pistols tend to be lighter and more comfortable to carry than 1911s, although some lightweight models of the 1911 are beginning to appear. Did the Armed Forces make a good choice? Well, I hope so. The M1911 isn’t the best gun for a beginner. In an absolute sense, the M9 is probably safer at ready than an M1911, although, in the hands of a trained person, the 1911 is perfectly safe. The additional rounds might also be an advantage to the nominally trained soldier or law enforcement officer possessed of marginal marksmanship. Which one do I like the best? The M1911, of course.